My story begins in a pew in the back of my parish church in Saint Louis, Missouri. I was five years old, and the Legos I was playing with during mass seemed a lot more interesting than everything that was going on up towards the front of Church. I remember thinking as I played, «What will I be when I grow up?» The usual ideas flashed through my head. «I’ll be a policeman or a firefighter. Or I’ll be a fighter jet pilot. Maybe an astronaut. Or I could be President of the United States…». That’s all I remember, but it was the beginning of a much longer story. It’s the story of my call, a call which began before my creation, and wasn’t all that easy to figure out. God didn’t ever stop me and say, «I want you to become a priest». I don’t think he’s done that to anyone. For some reason, he seems to want us to work out his will for us in the midst of much mystery and second-guessing. Mystery. Yes. That’s my story. It all just doesn’t make sense. Human sense, that is. I guess it only makes «God-sense». I remember my first holy communion. My friends and cousins had told me about all the loads of money I’d be given. I was thrilled to be able to receive our Lord, but I was also very excited to receive all that money! When the day of my first communion rolled around, everything went fine, until the time for presents came. My first present was a large gold crucifix. It was also my only present. Only twenty years later did things start to make sense. God had been preparing me. I wanted earthly gold, but he was thinking about gold of another sort.my first communion rolled around, everything went fine, until the time for presents came. My first present was a large gold crucifix. It was also my only present. When I was ten years old, my parents enrolled me and my brothers and sisters (there are nine of us!) in a newly-founded Catholic school called Gateway Academy. Gateway was special. For one, unlike public school, there weren’t any bullies. Even more important, I came into contact with all kinds of people who loved their Catholic Faith and were enthusiastic about it. I remember getting to serve mass on Fridays and what a huge privilege it was. Just kneeling there in adoration of our Lord during the consecration was one of my favorite parts of the week. I also remember doing the Stations of the Cross one Friday during Lent with my whole class. Our teacher had us do the whole thing on our knees – something that we all thought very funny. But by the end, nobody was laughing as we began to feel just a little of what Jesus went through to save us. I remember going to confession with one of the priests who would visit, and the advice he gave me filled with joy and good humor. I left the confessional bouncing along the clouds. How different it all was to meet people like him who were so filled with the Spirit! I remember a seminarian visiting our classroom and telling us the story of a little Mexican boy who gave his life for his faith during a war for religious freedom. Walking out afterwards, I felt a fire inside me. I wanted to do something big with my life too! It was then that I heard about Immaculate Conception Apostolic School in Center Harbor, New Hampshire. It’s a school for boys who want to be priests. Every August they have a month long «summer program» for boys who are interested in the school. New Hampshire sounded pretty wild, and the idea of a school like this intrigued me. «I’ll only stay for a week», I remember telling my parents. Wow. The Apostolic School was well – you have to see it to believe it. It’s like entering another universe, a universe where everyone loves their faith and is excited about it, where everyone is serious about living virtue and getting closer to God, where bad language is never heard and where everybody has one sublime goal – and it’s not power or money. We played soccer, basketball, and baseball; went hiking, swimming, and canoing, and basically had more clean fun than I had ever thought possible. The apostolic boys called their own fouls in soccer games and taught me things like how to shine my shoes and where to find the best blueberries on the mountain sides. I was particularly impressed by the priests who served as our chaplains. Not only did they love being priests, but they could also tell great bear stories, go hiking, canoeing, and play sports with us. I began to realize how full a life a priest could live. We began every day of the program with a short directed meditation followed by the mass. We also prayed the rosary in the evening and ended our day with night prayers and benediction with the Blessed Sacrament. At the end of each week my parents would call and ask how things were going. «Well, I think I’ll stay for just one more week», was always my reply. When the month finally did come to an end, my heart was torn in two. Spending a month away from home was one thing, but spending a whole year – or a lifetime – was totally different. Was God calling me to do this? You see, you don’t get sent to the Apostolic School. You either choose to go there freely, or you don’t. I prayed and thought and waffled back and forth. God had sent me no sign, or at least no sign as far as I could tell. I remember these thoughts passing through my head as I sat in the dining room one September night doing my homework. (I had already started school at a local Catholic all boys’ High School) It was all just so mysterious. I couldn’t get my head around it. But I did realize one thing: «I don’t know if God is calling me», I thought, «but it can’t hurt if I give him a chance». Only later would I learn of how hard it had been for my mom and dad to allow me to go once I had made my decision. Never before had they let one of their children leave home like this. But my parents were the ones who had nurtured my vocation for the last 12 years. They were filled with faith. They loved the Church. The one who finally convinced them to let me go was the Holy Father. He didn’t come in person, but in one of his letters he encouraged families to be open to the possibility of their children following vocations, even if very young. If the Holy Father was for it then my parents were for it and they gave their full support for whatever I would decide to do. I am forever grateful to them for having the courage and faith to let me go. I joined the Apostolic School in September of 1994. What began as mystery has continued just the same. God hasn’t ever appeared and told me His will. What he does do, though, is work deep within my heart. There he gives me a little light at a time, just enough to take another step, live another day in his service. I guess that’s how he likes it; otherwise, if we knew exactly what he wanted of us, we might get conceited and complacent. But this way he keeps us on our toes. My mom and dad love to tell a story about when I was two or three. It was Sunday mass. Legend has it that I stood up during the offertory and yelled at the top of my lungs, «Don’t sing! Don’t pray!». The congregation burst out laughing. The truly funny thing is that God has taken that and done a full 360 with it. «Sing! Pray!» are the cries that now rise from my heart. Sing the glory of God, sing his praises every day! Pray to him, let your life become prayer! My heart is full of gratitude to God for the tremendous gift of His priesthood. It’s not something I chose, it’s not something I deserve. It doesn’t make me any better than anyone else. But for some reason, God still gives it to me! May He be praised! May I do His will, be His minister, be His hands and His feet in this world that needs Him so badly. May all who come to me seeking Him, find only Him. Please pray for me, as I pray for all you who read this story. God has done great things in your life, just as he has done in mine. Magnificat! Let us unite our prayer to His Blessed Mother’s, and begin here on earth our hymn of praise to our one true High Priest. Fr. Kevin McKenzie, L.C., was born on January 24, 1982, in St. Louis, Missouri, United States of America. He entered the Legionaries of Christ as a novice in Cheshire, Connecticut, U.S.A., on September 15, 1999. He studied Classical Humanities in Cheshire. 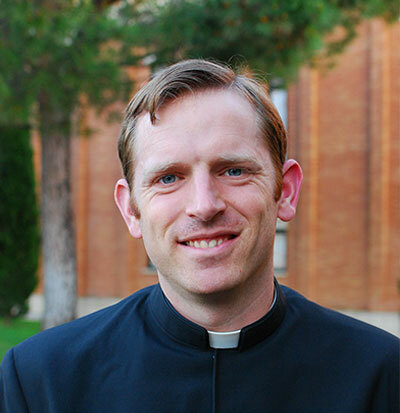 Has a degree in philosophy and theology from the Pontifical Ateneum Regina Apostolorum. He collaborated in youth ministry in Ohio, Lexington and Indianapolis (U.S.A). It is worth it to do God’s will!